This is so moreish and so healthy, you can have as your morning shake, lunch shake, snack shake, pre or post workout shake…….oh yes this is good anytime of the day….so yummy! At only 200 calories its even better! Simply put everything into a blender and wiz up until smooth. Divide into glasses. O.K…..so I’ve seen various versions of these, mostly on healthy eating or fitness sites, always admiring but never made…….so, having some off bananas left I decided to give it a go. Firstly mashed up the bananas in a bowl, add in the crushed walnuts, baking powder (this helps them go a little bit fluffier), vanilla essence and mix. Whisk the eggs together then add to the mixture, mixing together. Once combined add in the flour and mix well, it should look like a pancake batter. Heat a large pan to a medium heat and drop 2 tbsp’s of the mixture in, using the back of the spoon even out. Cook for about 2 mins each side or until golden brown. I served with some Maple Syrup. You can add any ingredient you like to the mixture and serve it with anything of your choice. Yum healthy pancakes. Love….Love…Love these! Full of goodness and energy. oh….and 1 skewer to hold banana in place. Melt the chocolate, peel the banana and insert the skewer, pour the chocolate over the banana while gently turning to cover. Then sprinkle the pistachio’s over. Love these for a post workout snack or simply just to indulge! 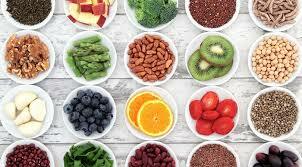 Who says healthy food needs to be boring? Looking for exciting new ways of making healthy choices fun and no better way than with food colouring! My Blue Marble Omelette with Avocado and Banana. Whisk eggs and cinnamon together, gently heat through in a pan. A few mins before ready place avocado and banana onto omelette then flip over and serve. Yum! Preheat oven to 180deg. Line a muffin tin with paper cases. Sift the flour, cinnamon and pinch of salt into a mixing bowl. Stir in the sugar a 45g of coconut (leave a tbsp amount for after). Make a well in the middle. Peel banana and mash 3/4 of it into a paste. Put 1/4 to side. 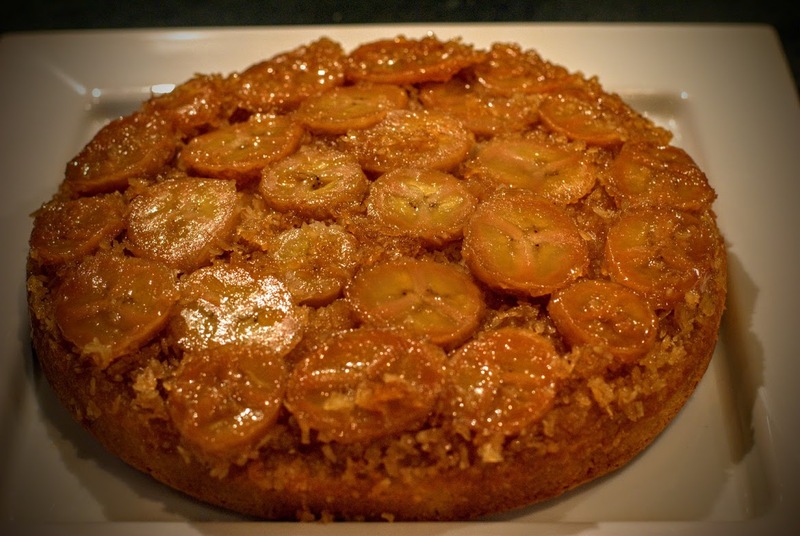 Put banana paste into well of flour mix. Lightly whisk milk, beaten egg, vanilla and melted butter together, pour into well of flour mix. Mix all ingredients together but do not over mix. Spoon mixture evenly into the 6 muffin cases. Slice the remaining banana and place one or two slices on top and sprinkle remaining coconut over. Place in oven and bake for about 20-25 mins until knife comes out clean. Leave to cool. Then eat to your hearts content! YUMMY! Also check out my other Muffin recipe:- Maple Syrup and Chocolate! BEWARE!! your kitchen WILL get messy! lol! I cheated slightly with this and used ready made cake mix. Preheat oven to 180 deg, grease the baking tin with spray oil. 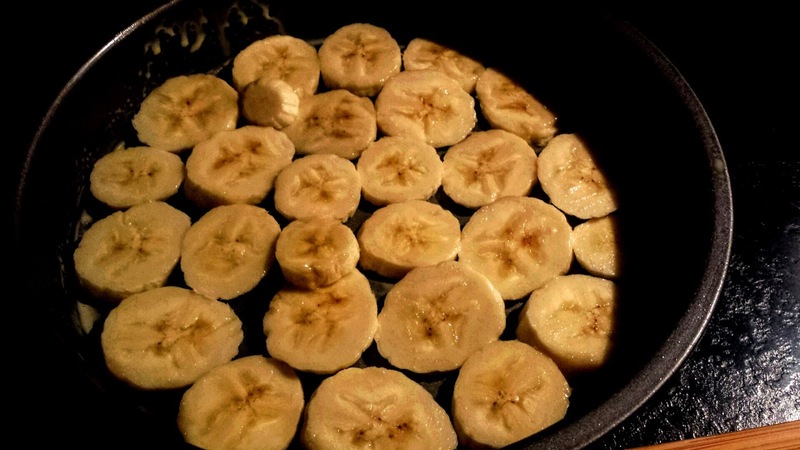 Place banana slices evenly on bottom of tin. In a small saucepan melt butter. Add brown sugar and lemon juice and heat until dissolved. 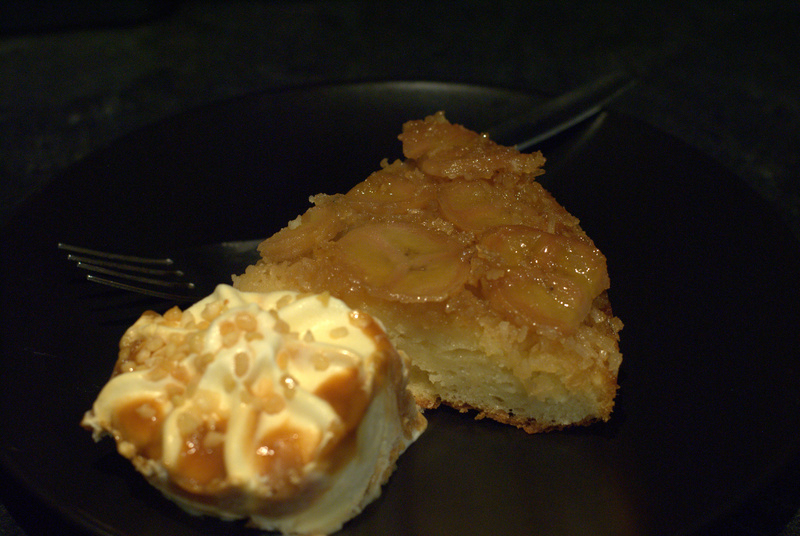 (approx 40 secs) Pour the brown sugar mixture into the cake tin over the bananas. 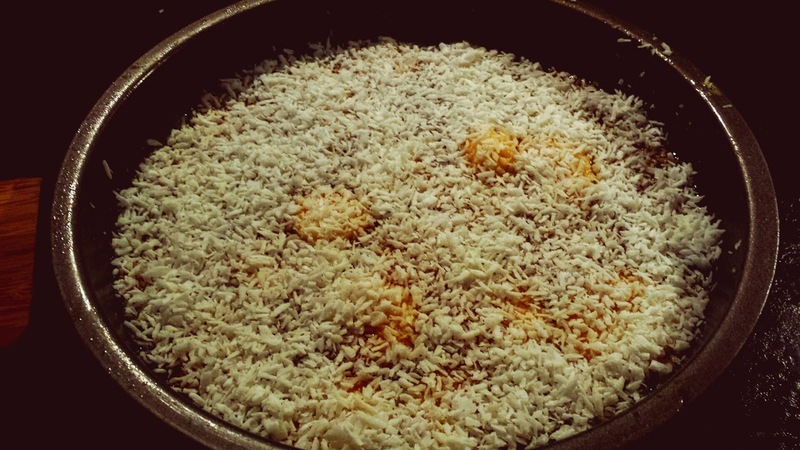 Sprinkle coconut over brown sugar sauce. Pour over the cake mixture and spread evenly. Bake in oven for approx 40 mins. 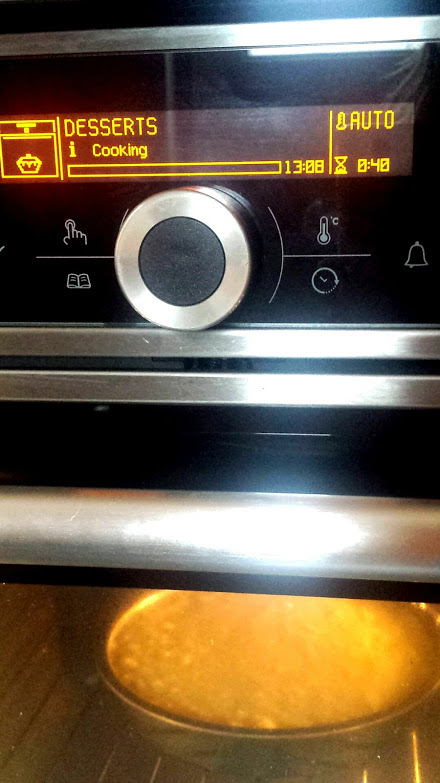 (If you have a Hotpoint Luce oven, use the dessert setting to bake). Let it cool for 5 mins then serve with some ice cream, custard or even just some whipped cream. YUMMY!! Now my fav snack………and healthy too! 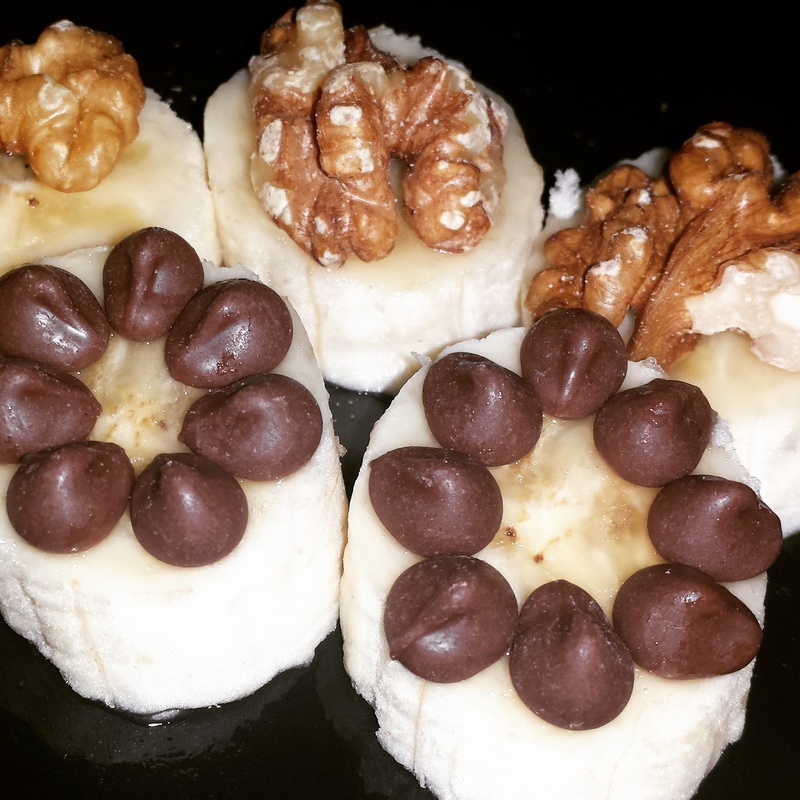 Chop a banana into small chunks, top some with dark chocolate drops and some with Walnuts…yummy! Or you can choose your own toppings, I’ve used a tsp of peanut butter on top too.